As we do business with home owners and business professionals on a day to day basis, we are constantly soliciting feedback from our customers. We appreciate hearing customers' opinions, whether the reviews are positive or negative, and that input helps guide our decision making process. Curtain-Tracks.com is proud of its strong track record of meeting the needs of our customers. We'd like to share some data that helps validate our claims of delivering against our commitment to be the best in class when it comes to customer satisfaction. 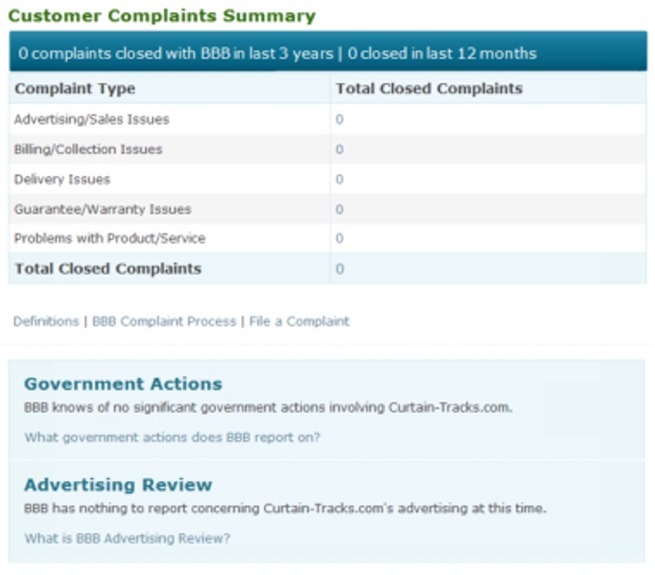 1- Curtain-Track.com has never had a complaint filed with the Better Business Bureau (BBB). We have earned an A- rating, with the only perceived drawback being the time we have been in business (operating since 2007). Curtain-Tracks.com is been accredited by the BBB for a year. 2 - Curtain-Tracks.com operates a small eBay store where we offer a sub-set of overall product offering. We encourage customers to purchase through our main Website, because the functionality (single checkout for multiple items and combined shipping rate calculations) and depth of information (product and compatibility information, product images, installation guides, etc) are far greater than what we can offer via the eBay platform. However, we do earn business from customers looking for parts and have not discovered our primary site, and will continue to operate that store as additional way to attract and retain customers. We have received feedback from over 425 eBay customers who rated their purchases, and we have never received a negative ratings posted over the last 4 years. This has helped earn us "Top Rated Seller" status from eBay. 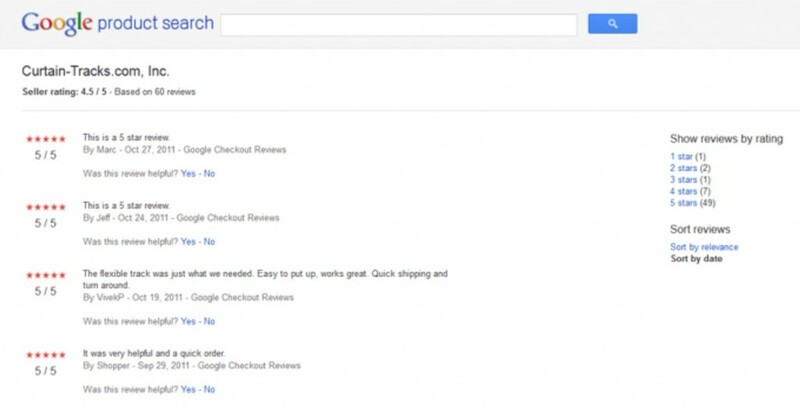 3 - Curtain-Tracks.com offers Google Checkout as a payment option via our checkout process. As a result, Google solicits feedback from customers who choose that payment option to rate vendors. While we have not had a perfect track record with this feedback, we do believe our rating of 4.5 out of 5.0 reflects an excellent track record, given certain biases that can occur while collecting satisfaction data. For those customers who were not satisfied and rated us with 1's or 2's, we wish there would have been an opportunity to address their concerns. We'll be the first to tell you that we aren't perfect. Issues do arise, as with any company that sells a wide range of products to customers all over the US and Canada. We feel our strength lies in how well we deal with issues when they are encountered by our customers. Our team works hard to meet everyone's needs and to satisfy our customers by getting them the right product in a timely fashion at a competitive price. By the looks of the ratings we have received to date, so far - so good. However, you are only as good as your last performance. If you have a complaint, suggestion, or compliment, we are open ears and appreciate your feedback. To contact us, call 888-434-7444, send email to info@curtain-tracks.com, or contact us via the website.